A hugely successful Crowdfunding campaign led to this most eagerly anticipated drumming DVD that offers a system to develop simply great time feel. Back in the summer of 2014, Benny Greb launched a Crowdfunding campaign that proved to be one of the most successful (German) campaigns ever, with numbers in their thousands contributing, all clearly expressing their desire to gain further insights from this magical player. The campaign reached, and then surpassed, its target in record time, allowing Benny to generate a DVD that takes the drumming genre production levels to new heights, including on-screen special effects and illustrations for a fully enjoyable and inspirational experience. 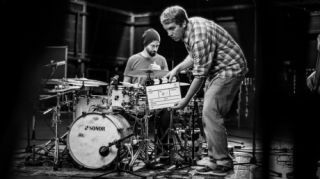 As Benny tells it, "I had a 'wish list' and a 'must-have' list and the response from the Crowdfunding campaign allowed me to fully realise my ideas, and totally produce the DVD that I always wanted to present to drummers worldwide." The purpose of The Art and Science of Groove is to take the techniques and exercises Benny presents, to gain positive and consistent results time after time, thereby removing the 'luck' element when it comes to finding the sweet spot that is 'groove'. "I always was interested in this quality of groove and how we can change the emotional impact of what we play; it's all about the flow. The exercises and tools that I present within The Art and Science of Groove are designed to put you back into the driver's seat." In The Art and Science of Groove, Benny introduces the five core elements of Time, Feel, Sound, Body and Mind and then sets out to shatter certain myths about this elusive, often misunderstood subject of groove, tackling each element so that Benny's practical and entertaining approach can be used and enjoyed by drummers of all levels. "I searched for the right elements, as they are the most valuable things that I could give to people and I wanted to find practical exercises that offered long-term solutions and changes. People have assumed that groove is a 'gift'. Groove is not a gift: it is a skill. Or, more specifically, it is the result of a combination of skills." The Art and Science of Groove DVD sets out to change many preconceived ideas and is intended to provide drummers with an emotional connection so that their playing becomes consistent each and every time they perform. The first element covers Time. Here, Benny offers alternative approaches on how we view the space in between the 'big notes'. As Benny explains, "With a metronome, the beats come where we expect them, but by employing the 'Gap click' and 'Moving click' concepts we can train our alarm system to make appropriate adjustments, thereby becoming much more comfortable with all the subdivisions." Benny points out that there is always so much more going on than just playing perfectly to the click and getting comfortable with the downbeat, as well as how important it is not to delegate the time to a machine, but rather to generate a solid and reliable groove of our own that is fully appropriate to the music, making the drum part sit within the musical context. The Feel chapter demonstrates further alternative approaches to making our playing groove, with Benny detailing his views on not what we play, but how we play, and how those qualities make the music feel. "The Feel chapter is really about the concept of where does groove come from and how it has an effect and can work even without having perfect time and yet the music still feels great! For educational purposes it was important to get some exercises into the DVD that covered this, especially to make us think more about the effect of what we play." Benny presents solutions that will allow for intuitive playing, demonstrating them with the bassist Fran Itt, with on-screen graphics and effects that can be viewed simultaneously as we enjoy the interplay between the two musicians. Sound can dramatically change the way a groove feels and within this section Benny describes how sound is our medium to get across our playing, pointing out that we have to take full responsibility for what we create in terms of sound, even ensuring that we grasp the fact that a rest is not nothing and that by including rests within our fills, we can add to the flow. "I offer ideas that can be used where we don't have to count the time but use sound to help with timekeeping. I found it very useful for myself to really hear the space in between and get a consistent time, especially with super-slow tempos. By listening closely and picking a point in the 'shape' of a decaying note for example, that can guide you to where the next note should come and the time then becomes super consistent." Benny crafted and honed the concepts used in this section during his drum camps, making them available to the diverse range of students he would encounter. Being aware of our body and how we can use it to create flow is as important as how we hold the sticks! "I found that students could make audible breakthroughs by ideas often as simple as just adjusting posture or being aware of our breathing to change the whole flow, making it reliable, consistent and not a matter of luck any more." Benny describes using 'air drumming' as a means to "getting it right from the start," pointing out that, "the song starts before the song starts." By incorporating consistent motion into our playing, this assists with the groove we create. The Body element connects listening to our hands and feet and demonstrates how the emotion we strive to create is generated by motion. "Your mind is where it all starts", explains Benny, as this element is a very important part of our playing. The Mind chapter helps us to shift our focus to what we want to listen to by using mental images or an image that captures a certain emotion. "Often we can have our hands on auto-pilot and that's where our musicality is not at play any more. I wanted to get this element into the DVD so that we consider what our expectation is of what we want to play, how it should sound and how it should feel." The cogs in this chain can have a huge impact on what we create, and Benny admits that he came up with solutions due to his own frustration, finding that they worked for him and for the students he would teach at drum camps. "I wanted to add ideas and concepts that had not been available before and share those with drummers and make people be able to fully diagnose their playing by offering solutions and elements that can be applied to everything that they do." This single high-density DVD offers a host of solutions and alternative concepts that can help any drummer approach their playing with a whole new mindset and will be of great benefit to players of all levels, as it will educators who seek an alternative approach as part of a curriculum to guide their students to the art of creating a solid and reliable groove. Bonus features include a 'Making Of' section, which offers behind-the-scenes footage, and a full section on 'Tuning' - how Benny gets his sound - a subject that many of those who assisted with the Crowdfunding campaign had asked to be included. Again, Benny busts certain myths and preconceived ideas within the 'Tuning' section, stripping it back to the very essentials. Included are performances from Benny's Moving Parts trio, along with solo performances, making for compulsive and repeatedly enjoyable viewings. Pick up the DVD from Benny's webstore.